Viburnum davidii is a low-growing shrub with large dark green leaves, delicate pink flowers and bright blue berries. The flowers have no fragrance. Viburnum davidii makes an excellent border plant, seldom growing more than 2 to 3 feet tall, and is a superior ground cover. Viburnums attract butterflies, which many gardeners enjoy. The plants require little care, are drought-tolerant, and will grow in a wide range of soils. They grow best in USDA hardiness zones 8 and 9. They do not appreciate particularly cold or hot weather. Cut out all dead branches in early spring, before the plant begins its new growth cycle. It should be possible to cut dead branches with pruning shears. Thin your plant as you are doing your spring cutting. Do not over-thin unless your plant has not been trimmed in several years and needs a great deal of work. Normally a well-tended Viburnum needs only minimal pruning during spring. Prune your Viburnum davidii for shape in late summer, after the plant has flowered. Pruning for shape before flowering runs the risk of removing the flowering parts of the plant and the berries. Waiting until after flowering to prune for shape allows you to keep most of the berries, which are a big reason for growing this particular plant. Examine the shrub, noting any dead, diseased or awkwardly growing branches that need pruning. Dead or diseased branches warrant immediate removal. Hold off pruning healthy branches until after the springtime flowering display. Shorten a branch by making a crisp, one-motion cut of the hand pruners 1/4-inch above a lower junction branch or leaf node. A node is a dormant bud on the branch, from which a new growing tip and leaves will form. Conduct light tip pruning of new growth or leaves across the growing season as needed, but refrain from trimming away branches after August. Viburnums begin developing their spring flower buds in autumn, so you don't want to blindly prune away next year's flowers. Known primarily for its white bushy flowers, snowball viburnum can occasionally produce pink blooms. While other viburnum shrubs develop tiny fruit clusters, the white blossoms on snowball viburnum do not produce fruit. The viburnum flowers in spring and has completed its display by summer. The flower clusters can contain up to 100 flowers and are 3 inches in diameter. The snowball viburnum's leaves nearly resemble the classic three-lobed maple leaf. 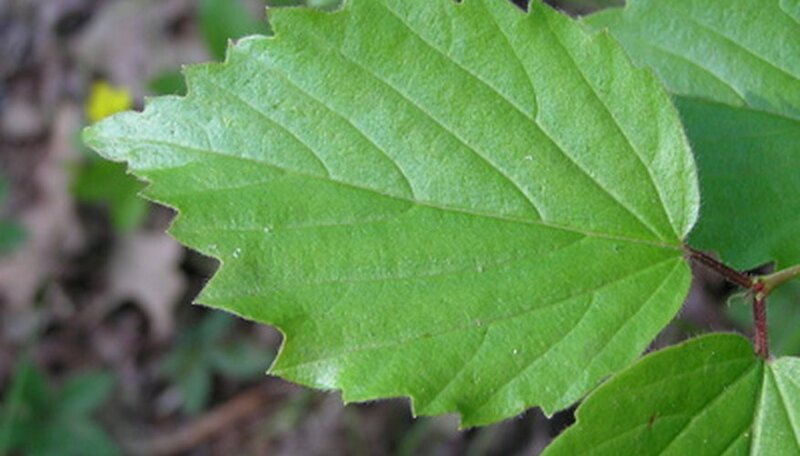 The leaves are matte rather than glossy and spring green in color, averaging 3 to 4 inches in size. Snowball viburnum leaves do not turn colors in fall, while other viburnum plants do display autumn colors. Snowball viburnum can reach up to 12 feet in height and 12 feet in width. Gardeners can keep the plant smaller with pruning. Native to Europe, snowball viburnum has been grown in the United States since the colonial era. According to the University of Arkansas, the sterile snowball form of viburnum is thought to have originated in Holland well before the 16th century. Called "Gelder Rose," the plant didn't contain the word "snowball" in its name until at least 1760. Gardeners can plant snowball viburnum in hardiness zones 3 to 8, which covers most of North America. The shrub grows in part sun to full sun. Choose a pair of pruning shears that will cut branches of 1/2 to 3/4 inch in diameter. Lopping shears are needed for branches that are up to 3 inches in diameter. Cut away all of the full-length dead branches with the lopping shears to give a rejuvenated look to the snowball bush. Lop off old blackened and overgrown branches near ground level to renew an older bush. Trim off the branches and twigs below the blossom clusters with pruning shears to remove the dead flowers from the bush. Cut a branch 1/4 inch above an emerging bud or near a second branch at the swollen point or branch collar to shorten it. Prune at an angle toward the outer portion of the plant to promote new growth. The snowball viburnum bears dark green leaves that grow up to 4 inches long and turn purple to red in the autumn. The snowball white hydrangea has dark green leaves that reach between 3 and 8 inches long. Snowball white hydrangeas and snowball viburnums both feature snowball-shaped clusters of small, white flowers. Snowball hydrangea flower clusters reach 8 to 12 inches in diameter. Snowball white hydrangeas display flowers from June through September, while Japanese snowball viburnums typically bloom in April and May. Snowball viburnums reach between 10 and 15 feet tall with similar spreads. Snowball hydrangeas mature to heights ranging from 3 to 5 feet with spreads between 4 and 6 feet. Snowball white hydrangeas are winter hardy in USDA zones 3 to 9. Indigenous to Japan and China, snowball viburnums generally thrive in USDA hardiness zones 5 to 8. Both plant varieties prefer well-drained, loamy soils. The snowball white hydrangea thrives in fully sunny locations, while the viburnum needs partially shady to fully sunny planting sites. Prune out diseased or dead branches. Use a pruning saw for branches over 1 inch and pruning shears for smaller branches. Prune branches that are rubbing against each other. Cut back suckers at the ground if the base of the plant is becoming thick and crowded. Prune your Autumn Jazz viburnum shrub within two weeks after bloom has finished for the season. Timing pruning this way will preserve the bulk of the following seasons' buds and bloom. Prune away any damaged, dead, dying or crossing and abrading branches down to the crown of the plant and pull the cuttings clear from the canopy. Prune the tips of branches as needed to reduce the size of the viburnum or to improve the shape or symmetry of the shrub. Rake back the mulch and any leaves or other detritus from beneath the Chindo viburnum. Remove any weeds from within a three-foot radius of the shrub. Spread the fertilizer, at the rate recommended on the package, to one and a half feet beyond the longest branches. Water the area until the soil is saturated. Spread a three-inch layer of fresh mulch around the base of the Chindo viburnum. Don’t allow the mulch to touch the bark of the shrub. Choose a date in the early spring to fertilize your viburnums, and then mark your calendar so you don't forget. Dress in long clothing the day you plan on using the fertilizer. It contains harsh chemicals and can damage your skin. Wear protective gear, such as goggles, gloves and a mask. Again, this is to protect you from the chemicals in the fertilizer. Read the packaging label for a 10-18-12 (nitrogen-phosphorus-potassium) slow-release fertilizer. The brand you use will most likely require you to mix the fertilizer with water before you apply it. 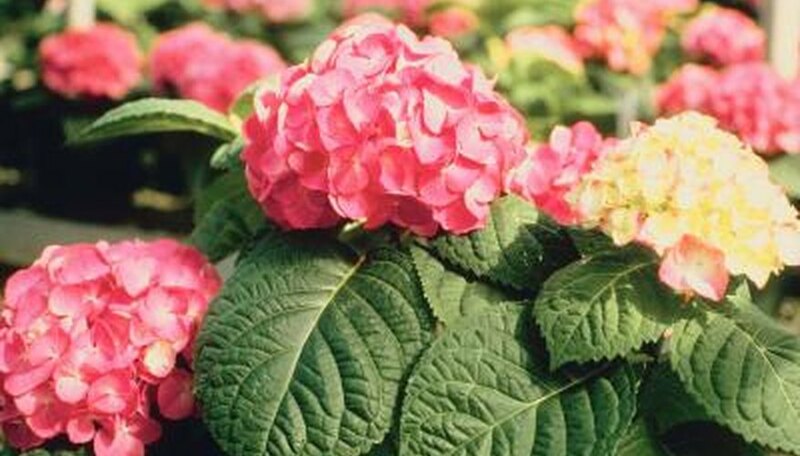 Merrifield Garden Center of Virginia recommends this type of fertilizer for viburnums. Apply the fertilizer around your viburnums as directed on the packaging label. First, decide when to prune. Viburnum flowers open in spring from buds that are formed the previous summer, so if you prune later than the end of June, you'll be cutting off the next year's blossoms. May is ideal, though any time from the end of bloom through the middle of June will work. Next, imagine the changes you want to make in your shrub. Is it too tall? Is it too wide? Too dense? Too close to the wall of the house? The more clearly you imagine the results of your cuts, the more skillfully you can place them. Now, using your lopper, prune any stems that are too tall all the way to the ground. Cutting back part way forces growth out at awkward angles that spoil the shape of the shrub. When older, taller shoots are removed completely, a more open but still graceful framework is left behind. Finally, using sharper pruners, remove any branches that extend too far to the side by cutting them off at their base, at the trunk they sprouted from. Again, cutting them off part way will force out new growth at unattractive angles. Viburnum Alfredo should be pruned as soon as the flowers die in the spring. Any later in the year and you will prune away next season’s flowers. Begin pruning the viburnum nudum at the base of the plant. Remove any old, woody branches growing from the ground. Do not remove any of the young shoots that are the thickness of a pencil. Prune any too wide or tall branches to bring the plant to the desired shape. Prune these back to a node (swollen part of the branch where the leaf joins it). Rake the planting bed to remove any fallen leaves, twigs and branches. Water the viburnum nudum until the water puddles at its base.